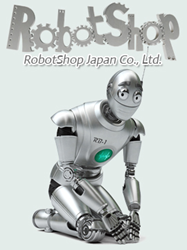 RobotShop Japan stands out and creates an important link with the rest of the innovative world of robotics. Japanese novelty will now be powered by RobotShop! RobotShop Inc. announces that it officially begins operations in Japan by launching a logistics center in the territory as well as a dedicated website. RobotShop offers unique products in the field of domestic and professional robotics via localized websites in the spoken languages and major currencies used in the targeted regions. These regional websites offer quick and affordable shipping options, supported by optimized logistics, involving one or more territory specific warehouses. RobotShop already serves Canada, the United States, the 27 countries of the European Union and now Japan. Customers around the world without a dedicated logistics center can still be cared for by one of RobotShop’s websites based on their proximity. "Japan is a key market for robotics." Said Mario Tremblay, RobotShop CEO. "This sector is a priority for the Japanese government and several Japanese companies. Therefore we have now, not only a logistics base to better serve our customers in Asia, but also a base for surveillance and innovation to better follow market developments in that part of the world." RobotShop’s websites offer a great variety of advanced functionalities in order to provide an excellent customer/user shopping experience. RobotShop pays particular attention to the technological development of its e-commerce platform and its internal processes in order to continually improve user experience and service offered to its customers. "Here in Japan, we have already entered the era where robotics is no longer solely mechanical slaves for the industry, but servants of all." Says Yves Lacroix, Director of RobotShop Japan. "Robots no longer wait for our orders but judge how best to serve us, and are part of our daily lives. With this theme, RobotShop Japan stands out and creates an important link with the rest of the innovative world of robotics. Japanese novelty will now be powered by RobotShop!"